To avoid the stagnation of their workforce, companies need to develop their people and align them with their current or projected strategic direction. Give companies ways to identify, grow, transition and retain the adaptable talent that fits their strategic needs, and avoid the stagnation of their workforce. To differentiate ourselves in a competitive market, we needed to define a desirable role for the application and how it would meet the needs of the Human Resource Manager. We were excited by the opportunity to create something more valuable to the user. To discover our audience needs, we interviewed several users, individually and in a group. From our group interviews, we mapped out pain points which lead directly into our design process and focus on features. Then we continued by understanding the whole ecosystem of Human Resources and talent, focusing on the Company Strategy. We mapped the design cycles we would need to focus on from a road map point of view and the functionality we would be concerned with. The requirements, we determined through research, were synthesized and tested. Through that, a 3-part solution was proposed. An employee-customized career plan for success, that allows employees to grow according to their own strengths, desires and motivation, while staying in alignment with the company’s business strategy would accommodate the needs of the user and solve their pain points. The tool would give them the opportunity to identify strengths and grow in key areas, all while staying a vital and aligned employee. The Change Manager is a tool to help companies adapt quickly to strategic challenges. It helps organizations assess strengths and weaknesses and help its workforce align to those changes. An employee-customized career plan for success, that allows employees to grow according to their own strengths, desires and motivation, while staying in alignment with the company’s business strategy. The tool gives them the opportunity to identify strengths and grow in key areas. Is a tool that helps organizations identify and retain the most valuable employees. It provides insights around skills as well as tools to counteract bias, reward and course-correct employees who are adapting to change. This user flow shows how a user can manage the growth and promotion of an employee. This functionality creates a Success Plan to evaluate and use for an employees career growth. The plan defines who is most retainable and essential. Once changes happens, the workforce system updates and gets the employee aligned to the Success Plan. This user flow shows how an employee can define themselves, rather than be defined by the company, based on their own strengths and interests. By defining themselves, their Success Plan is matched to them. A manager recommends the employee and encourages them to succeed. Through our philosophy of “Make Important Things Fast”, the main screens haves been designed to allow users quick access to primary functions of the application. By “Minimizing Learning” people on-the-go or desktop based users can depend on their prior experience with past systems and existing system design conventions to help them learn to use the application. A Retention Plan has been built as a contingency for any kind of employee change. 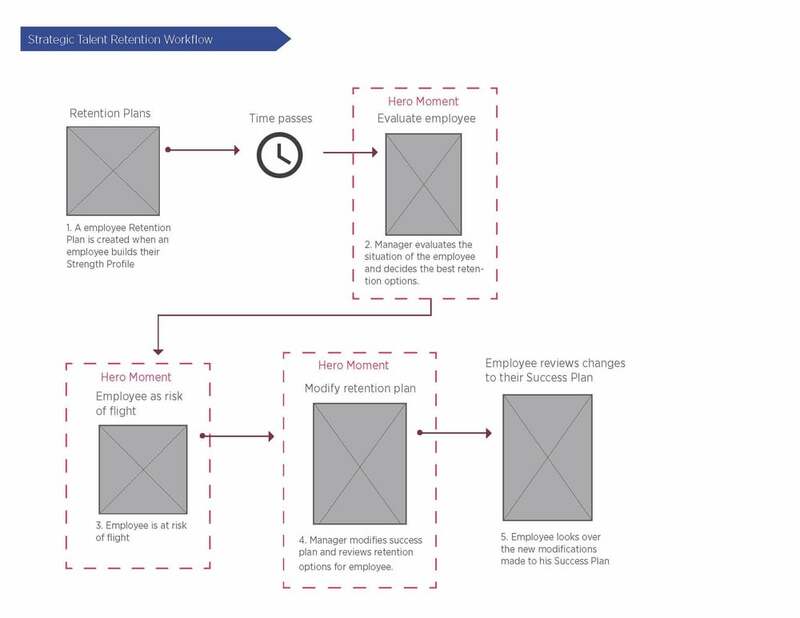 A user can implement the Retention Plan and select the ways to keep a valuable employee. Users like the automatic retention functionality that predictively diagnoses the propensity of employees to leave and includes ways to retain the employee. Finished comps and prototypes were produced through my guidance and management of a UI designer, and used to develop the application in an Agile environment. Because of tight timelines we chose to develop a high-fidelity prototype in InVision. The prototype was a powerful tool in creating transparency in our design process. The “What you see is what you get” approach strengthened our relationship with our client and allowed us to gain feedback and approval from both our client and development partner. We focused on all form factors, knowing users touch points with the system vary based on their own preferences and patterns of use.